The track has got a bit worse for wear since the last visit, although some bits had not changed that much it did seem that the alpine area had become somewhat more degraded, The ascent to the plateau below Mount Sarah Jane was hard and persistent and entailed some 640 metres of up over a distance of 1.7 k, with the last part of 250 metres over a distance of 500 metres quite steep (1:2). Little wonder we were tired by the time camp was reached. Although at the start of the day the cloud was low it gradually lifted and cleared away to be very pleasant by day's end. On top of that there were no mosquitoes or flies and other pesky insects and that remained the situation for the whole trip. 26 January 2012At times there was a little bit of drizzle and it was mostly cloudy, but plenty of fine weather including a few patches of sun. 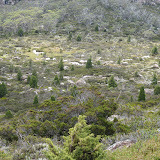 From near Johnson Tarn we headed out to Mount Bridges, with the view down to the saddle between looking quite nice studded with Pencil Pines and pools.